Published: April 15, 2015 at 11:57 a.m. Updated: April 15, 2015 at 12:27 p.m.
Buffalo's 111 sacks over the past two seasons lead the NFL while posing the question: Can the Bills grow even fiercer under Rex Ryan? 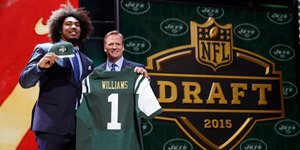 Busy installing his multiple-look front seven, the newly hired coach has handed control of Buffalo's defensive line to assistant Karl Dunbar, who spent the past three seasons guiding a Jets front stocked with Sheldon Richardson and Muhammad Wilkerson. With Mario Williams and Jerry Hughes at end and Marcell Dareus and Kyle Williams manning the tackle slots, Dunbar used the word "dominance" to describe his new crew. "Now, who are you going to double team?" Dunbar asked, per Vic Carucci of The Buffalo News. "If you double team everybody, that's eight guys you've got to keep in. With the quarterback, that leaves you with two-receiver routes. I'm going to love that. We can get after people." Dunbar gushed over Mario Williams as a "6-foot-6, 295-pound guy who runs a 4.7," adding: "When you get him going, he's hell on high water." The challenge in Buffalo is coaching turnover. The defense has worked for three coordinators -- Mike Pettine, Jim Schwartz and now Dennis Thurman -- in as many seasons. Ryan's defense, though, is a welcome return to what Pettine -- Rex's longtime protégé -- ran two seasons ago, when Buffalo set a franchise record with 57 sacks. Dunbar promised that the Bills would challenge opponents with a varied-look front that befuddles quarterbacks and keeps play-callers guessing. "What's three plus four? What's four plus three? We're going to have seven guys," Dunbar said, referencing the mayhem we saw from Rex's defense during his better days with the Jets. As for the Jets, Ryan has a plan in place for the franchise that fired him in January, recently telling The MMQB: "We're gonna try to kick the (expletive) out of them when we bring our team in." September can't get here fast enough.